Recruitment season is almost over! With only one information meeting left, we’re over-the-moon with how the past couple have months have gone. We’ve gone above and beyond expectations across the board, and we’re so grateful to you guys for putting in the hard graft day after day. Now that December is just round the corner, it’s time to get in the merry Christmas mood by rounding up the successes of the past month! A quick note before we get started. You should have all been added to your respective forum (marathon or treks) - please could you add your entire team to the forum that you have been added to. We don’t want your teams missing out on all the content we’ll be uploading! November has been a great month for pulling in those last minute sign-ups, whether it be from our late marathon meetings or overseas trek re-runs! Top of the list is Sam’s trip down to Exeter. Sam presented four information meetings in two days (Kili x1, Machu x1, Morocco x2) with awesome results, thanks to the incredible energy of the Exeter team throughout their promo! 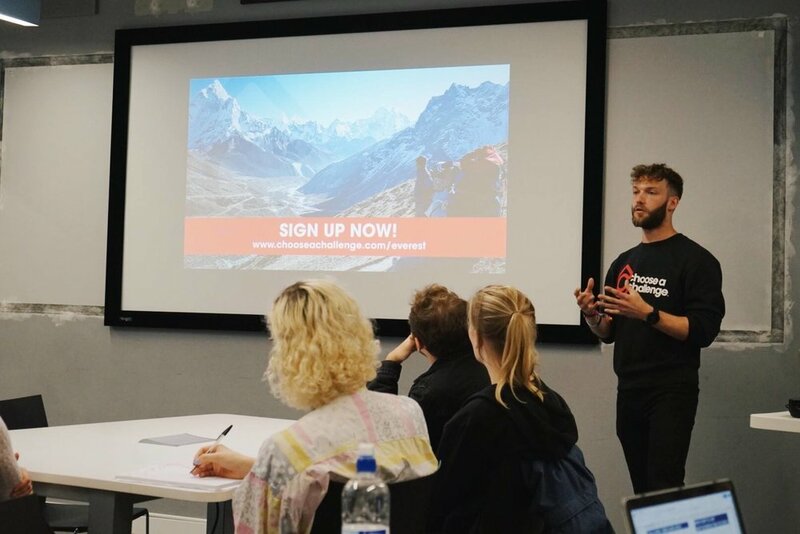 One of our boss brand ambassadors, Connor, travelled to East Anglia to present Three Peaks and was able to pull in 10 sign-ups on the night alone - an incredible result! Massive well done to Connor and the UEA team for getting so many keen beans in the room. Ellie has been superb this month, getting her trek training booked in nice and early. She absolutely smashed her recruitment and follow up, meaning she's been supporting an amazing team of 23 - she's recruited so many people we're actually needing to get another leader! Although the majority of marathon recruitment is just around the corner, your first marathon training workshop is ready to go! If you’ve already recruited your marathon team, this is your opportunity to get ahead of the game and get this workshop in before the new year! In either case, this first marathon training workshop needs to be presented by the 18th February 2019. The workshop itself is centred around getting participants to a base level of fitness before starting their more intense training. Hence why the workshop needs to be presented sooner rather than later. It is likely that you will not get full attendance to this workshop as some people will already be keen runners, bit it’s so, SO important that it gets presented to ensure that each of your participants has a fair chance in completing the marathon. The workshop is now available in the challenge leader resources tab on the Challenge Leader Hub. You can find it here. Please be sure you have presented your trek training workshop by this time. If you haven’t, or can’t, please let us know and we’ll schedule a post on your Facebook group with the slides. Our second Strategy Day of the year took place last Friday (16th) and was a great success! It was awesome to see so many of you come along and learn more about changes to our strategy and plans for the year ahead. We were also very lucky to have some guest speakers from Warwick RAG, Kent RAG, and UCL RAG. Warwick RAG spoke about how best to organise your committee and were able to convey their model, which has seen success year-after-year. Kent RAG shared their recruitment plans and experience, relaying their best practices to ensure as many people come to information meeting rooms as possible. UCL RAG imparted advice on why expanding your event portfolio can be met with great success, mostly as a result of the extra events offering a low-cost and accessible alternative to our bigger treks! The team were also able to share our new opportunities for students, including in-country operative roles, brand ambassadors, and internships. 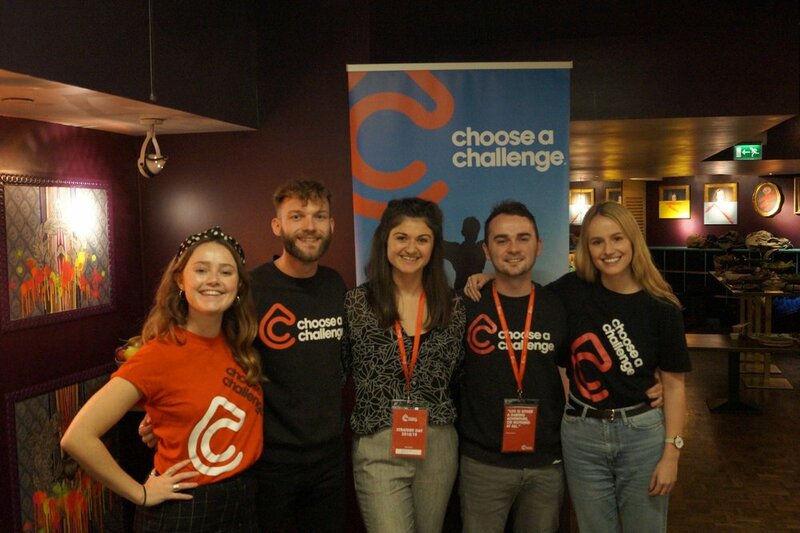 If you have any questions about the above roles, please get in touch with the team at team@chooseachallenge.com and we’ll be able to help! For December, look forward to a festive-themed newsletter with loads of sweet, sweet content for the Christmas season. Again, thanks again so much for all your hard work throughout recruitment season - you’ve been awesome!